From a death trap to now a tourist attraction. It is a story that must be told and the telling must never stop. The story of Auschwitz-Birkenau. 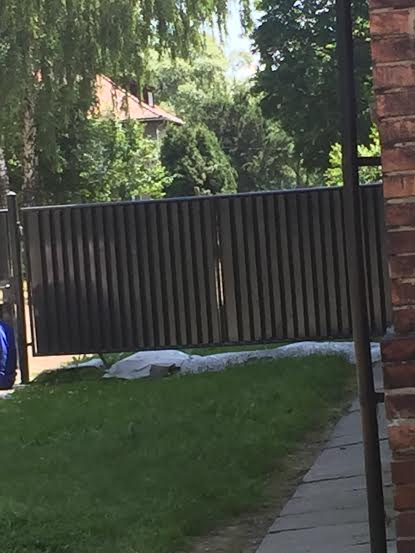 On Wednesday, June 15th, 2016 I visited the remnants of the largest Nazi extermination camp, located in Poland, approximately 67 kilometers (42.6 miles) from Kraków. Getting off the tour bus that takes you there from Kraków, you realize that you stopped at a tourist “attraction.” Approximately 7,000 people visit this site of horror each day. 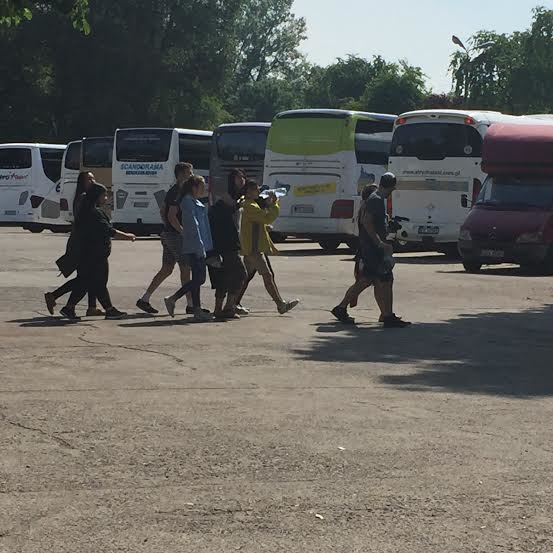 Tour buses of all sizes and private tour guides fill the parking yard and hundreds of people roam at the entrance; all in the business of a visit to Auschwitz. 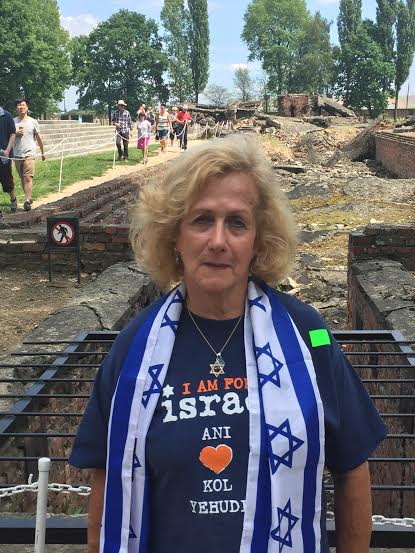 Is it a pilgrimage of solidarity, mainly with the Jewish people, because so many thousands were exterminated in the Auschwitz-Birkenau gas chambers and their bodies burnt to ashes? Or, is it some mankind guilt that brings one to visit the site? Is it to perhaps learn what Never Again really must mean? Or, is it just a visit of respect to a place where crimes, perpetrated by human beings and so difficult to comprehend, took place? The Nazis were not satisfied with one Auschwitz camp, they built three, Auschwitz I, Auschwitz II-Birkenau and Auschwitz III. Of all three extermination/concentration camps, only Auschwitz I buildings remain standing, while Auschwitz III was totally destroyed. But the horror and act of revulsion that took place in all three camps is unfathomable. Auschwitz II-Birkenau – I, the writer, stand near the infamous entrance of what was an entrance to hell. The name of the town where Auschwitz is located is in fact Oświęcim but the Nazis changed the name to Auschwitz. That is the German name, as we know today. My tour guide for the day was Evelina, born and living in Oświęcim, today a town of 50,000 residents. Before the Nazis marched in and conquered Poland, 60% of Oświęcim’s residents were Polish Jews; today not one Jew lives in this town. 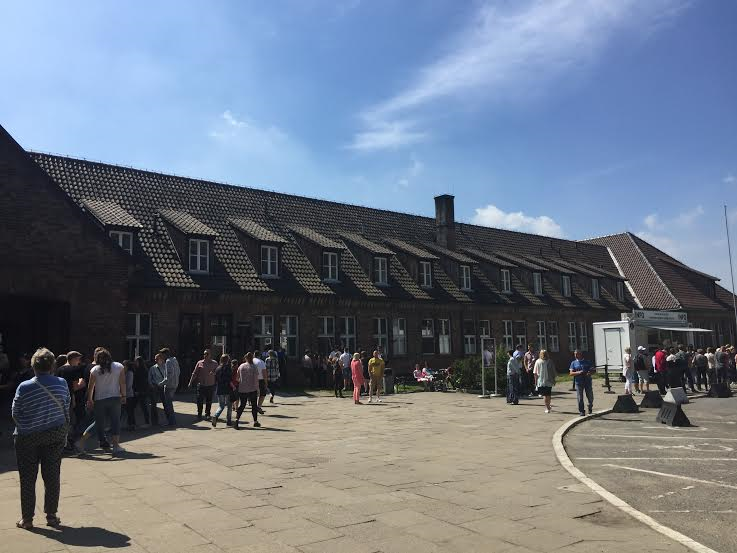 As I walked toward the first building, apparently the offices of the Nazis who ran Auschwitz I camp, my heart dropped and a chill went through my body. The Nazis took over Poland on September 1st, 1939. The camp’s 28 barracks, well-built and sturdy, were erected 1918, after WWI, for the Polish army. 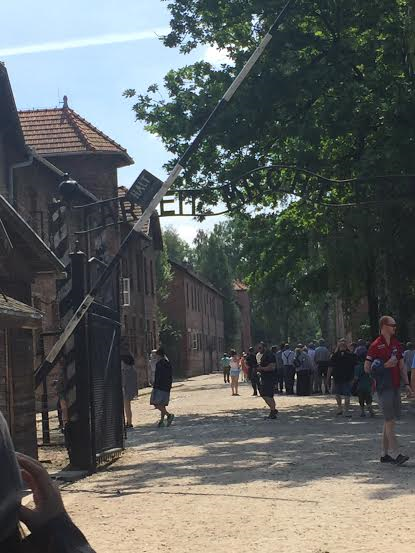 The Nazis found the camp and turned it into their perfected extermination camp. The barracks are all original, and each one held approximately 1000 prisoners. At First the Nazis used Auschwitz I camp to hold Polish political prisoners. Later with their voraciousness to murder, inter alia Jews, political prisoners, Gays and Gypsies, the Nazis extended the camp to Birkenau, making it Auschwitz II, a camp twenty times larger than Auschwitz I. There, Auschwitz II, the Nazis performed unspeakable atrocities. They lost any human image they may have had. In 1942, at the Wannsee Conference, the Nazi top commandants decided on the Final Solution for Jews. There they assigned Auschwitz to be the main extermination camp and Auschwitz became the Nazi collecting hub for Jewish people destined to die, whom they brought from all over Europe. During its operation period, Birkenau was the largest Nazi extermination camp in Europe. Auschwitz I – the Crematorium. Auschwitz II – Birkenau – I, the writer am standing by the destroyed gas chamber. To perform their atrocities well and be calm, the Nazis used camp prisoners’ orchestra which stood in front of the kitchen and played music all day. 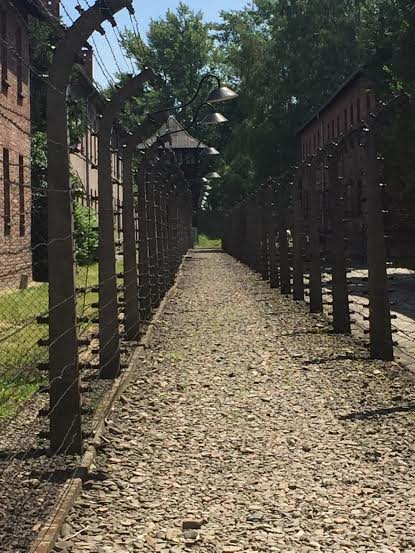 Most of us are familiar with the grotesque sign at the entrance to Auschwitz: “Arbeit macht frei” meaning “work sets you free.” This was the context along which the Nazis brought the Jews to the camps. They promised to give them a new life including work. Perhaps the Nazis really meant that this kind of work, murdering people, will set them free, a justification for their long murdering spree. Auschwitz I – entrance sign Arbeit macht frei. Rudolf Franz Ferdinand Höss was SS-Obersturmbannführer and the longest-serving commandant of Auschwitz concentration camp. He tested and carried into effect various methods to accelerate Hitler’s plan to systematically exterminate the Jewish population of Nazi-occupied Europe. Höss introduced pesticide Zyklon B containing hydrogen cyanide to the killing process, thereby allowing his soldiers at Auschwitz to murder 2,000 people every hour. He created the largest installation for the continuous annihilation of human beings ever known. At the end of the war this coward could not admit his crimes and did all he could to hide. Höss was responsible for the deaths of three and a half million men, women and children. Justice did catch up with him. In April 16, 1947 he was hanged on a short drop gallows, constructed specifically for that purpose at the location of the camp’s Gestapo, which is on display at the site. Seeing Höss’s home from a distance and his execution place does not bring justice to the millions he systematically helped murder. Dishes as the prisoners really thought they were coming to start a new life. 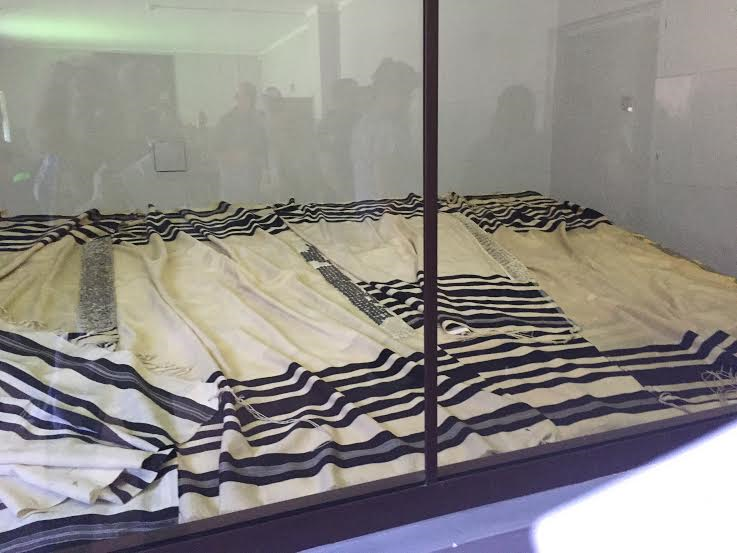 Auschwitz I – Jewish prayer shawls; to the last minute of life believing in God. All the above are on display behind glass. The Nazis found ways to strip a human being of his or her humanity. They indiscriminately used people for death by gas and medicine experiments. From the time a prisoner was brought into the camp, after stripping him or her of everything it took 24 hours to make ash out of a person. The Nazis’ methods of starving, punishing and execution styles of the prisoners only leaves one wondering, what else they would have come up with had they not been stopped? 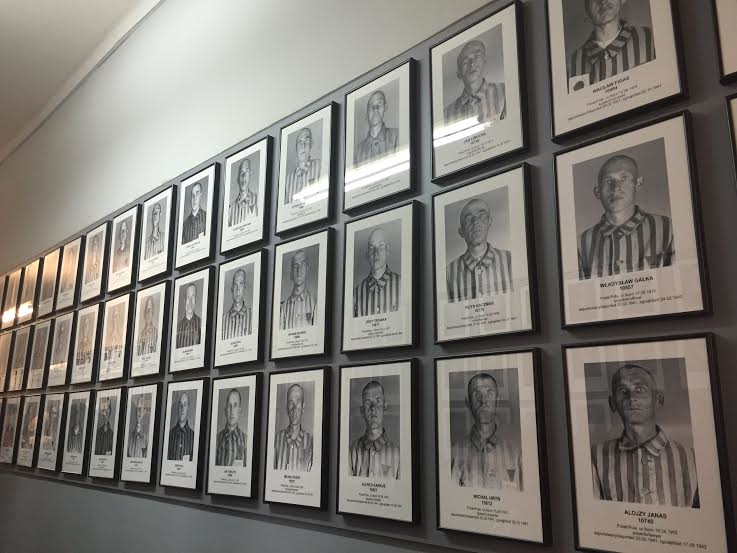 Auschwitz I – Bloc 7 rows of found prisoners’ photos on display, time of arrival and time of death. With Auschwitz I the Nazis started small and soon they saw the “good” that came out of murdering people so they expanded their killing field to Birkenau, a camp 20 times larger than Auschwitz I. There, conditions were much worse. The buildings, created in a hurry by prisoners on swamp land, were made of wood and offer no sanitary or living conditions. In Birkenau the Nazis perfected the extermination by Zyklon B gas chambers and the crematorium and achieved 1400 dead in one gas chamber load. What an achievement that was! After the war, the Polish people who came back home and found their homes destroyed used these barracks’ wood to rebuild their own homes and thus at Birkenau evidence is much lacking. 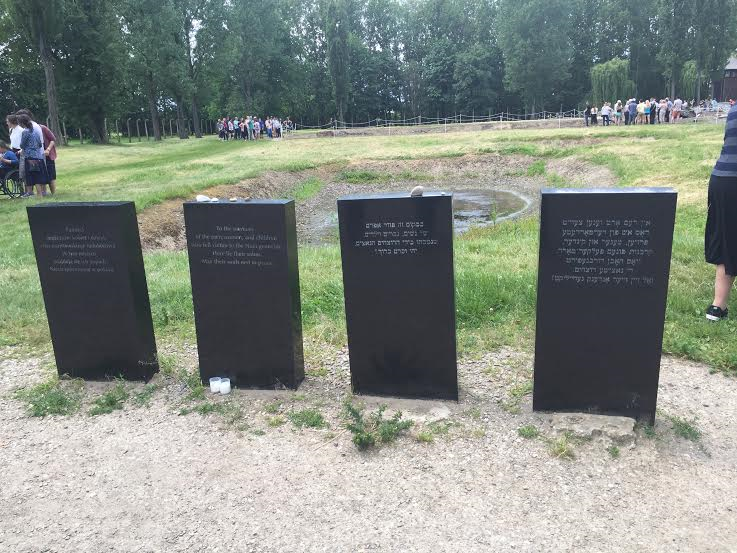 But the remnants of the gas chambers and crematoriums, the largest two buildings in the camp, which the Nazis destroyed in order to hide evidence, are a profound testimony to what took place there; human ash is mixed with the soil of the land. 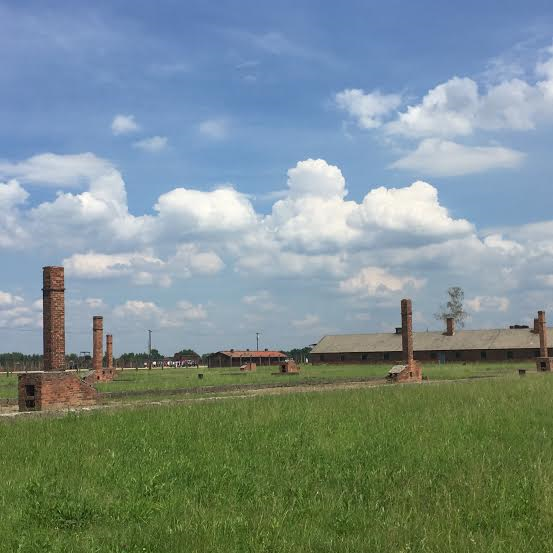 What the eyes see in Birkenau is all original, as was left by the Nazis. 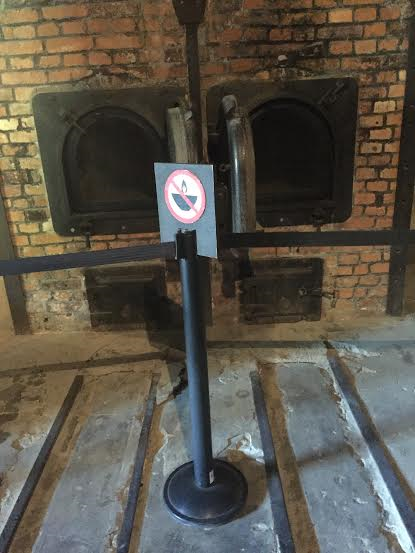 I was informed that only 12% of Germans are visiting Auschwitz. I think it should be mandatory for every German to visit and learn what a generation ago of Germans were capable of doing. Right at the entrance to Auschwitz I a large willow tree grows that has been standing there since before and when the Nazis took over this Polish military camp. In Judaism, the willow tree is among the four species used in the Feast of Tabernacles and is mentioned in Leviticus. But the willow tree is mentioned in the Bible in one of the most known and most quoted hymns – in the Book of Psalms, Chapter 137, a symbol to the cry of the Jews who were exiled to Babylon after the destruction of the First Temple. Does the willow tree at the entrance to Auschwitz symbolize the weeping to come in this tragic place? 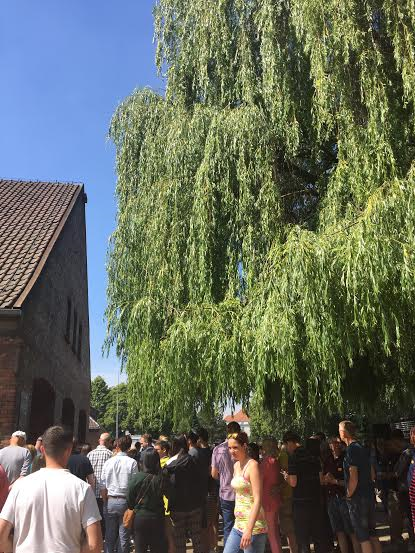 Auschwitz I – the old willow tree, has been crying for decades. There is a song recorded by Gene Pitney in 1961, it is called Town Without Pity. That was Auschwitz, a merciless town. 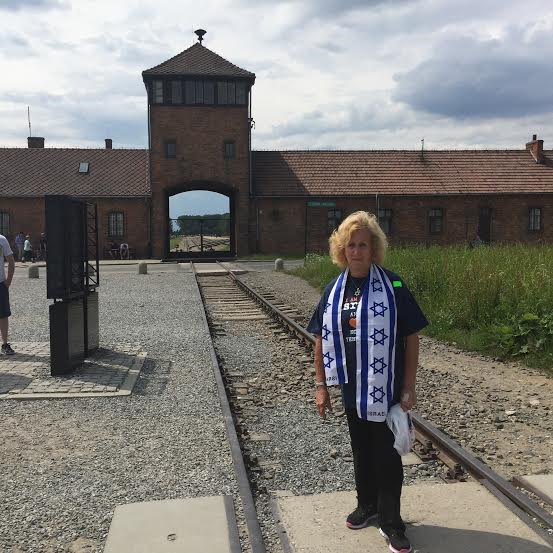 The humiliation and dehumanization that took place in any of the Nazi extermination, concentration, and forced labor camps should be an alarm bell reminder to any human being that ‘Never Again’ must really be ‘NEVER AGAIN’! 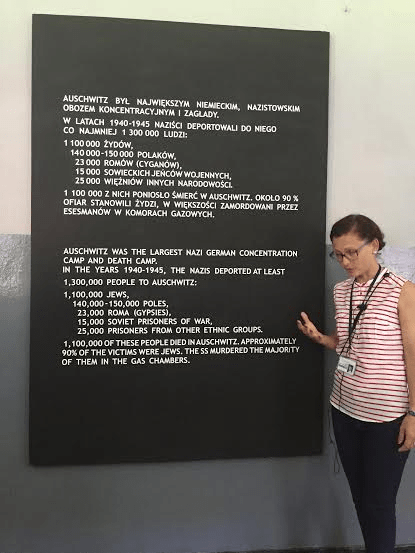 Auschwitz I – Tour guide Evylina points at the camp’s achievements.